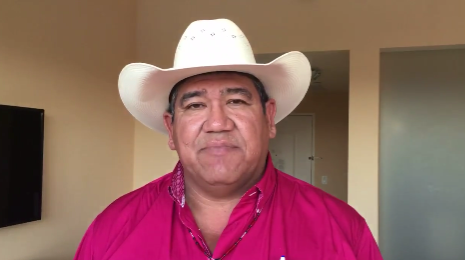 LOS ANGELES -- Cheyenne River Sioux Chairman Harold Frazier said he did not get the response he hoped for during a meeting with President Obama today. "I didn't really get the answers that I was hoping for, but I'm still optimistic we will prevail in stopping this pipeline," Chairman says in the video below. Chairman Frazier said Obama agreed to continue working through the proper channels and agencies in the federal government. Chairman Frazier urged everyone to stay strong. "We have to stay strong and keep up the fight." "In the end, we will prevail." "In the end, we will stop this pipeline." Let's keep working," Chairman Frazier said. In other news tonight, Hollywood actor Mark Ruffalo spoke with Standing Rock water protectors. During the gathering at the casino hotel, the water protectors received a message that a large convoy of police were enroute tonight. The front line warriors, with the magnitude of Crazy Horse, in the Spirit of Crazy Horse, rushed from the talk room before Ruffalo spoke. Mark Ruffalo spoke on how the forces want to divide people. "The Black Snake is here." Ruffalo spoke on the depth of suffering that the Native people have, and how it is what the world needs right now. Ruffalo said he is humbled and honored to be here. He thanked the people for what they are teaching him and said he will be with the water protectors tomorrow, Wednesday. DAPL is pressing to drill where the new Sacred Ground Camp is located on the path of the pipeline. Law enforcement special operations from Minnesota, Indiana and other states were seen enroute to Standing Rock. Watch below, during a panel discussion, including Actor Mark Ruffalo, at the Standing Rock casino hotel tonight, the call goes out for front line warriors. Today Oct 25th, 2016 National Native Media and Consulting arranged and facilitated a meeting with President Barack Obama and Cheyenne River Sioux Tribal Chairman Harold Frazier to address the ongoing NoDAPL and treaty issues. This meeting is in conjunction with POTUS visit to Beverly Hills, CA. To clarify the rumors that this is an intertribal meeting, National Native Media and Consulting reaffirms that this Obama meeting only has one tribal chairman in attendance, Chairman Harold Frazier. National Native Media and Consulting is a 100 percent Native Owned Consulting Firm who have been in operation for over 16 years. National Native Media and Consulting does not use social media or advertising to promote them selves. To better protect the interests of their clients, all projects are kept within their circle. Cheyenne River Chairman: whether or not that pipeline gets built the people had to say No. There are plants, birds, animals, fish that may go away and we will never see again, & that is sad. You are a good person to try to do whatever you can to keep life going. You win through your integrity, humility, kindness, and courage to not just go along with a plan that looks like is so great to fight against. In a world full of tricks, deals, & politics; you win because you are not breaking our hearts. You win because you give us hope. You win because we will continue to try to do better. SEE FOR YOURSELF: BE informed of who your enemies are! In particular, we already know quite a bit about Trump's connections to the fossil fuel industry and to the Dakota Access Pipeline. Trump has deep financial and personnel ties to the pipeline, which would transport nearly 500,000 barrels of fracked oil per day from North Dakota to Illinois. The pipeline threatens the water supply and sacred lands of the Standing Rock Sioux, who have joined with dozens of tribes and other groups to stop the project. While much of Trump's finances remain a mystery, he did have to file a financial disclosure form when he declared his candidacy for president (despite his claims, this is not the same and does not provide the same level of transparency as a tax return). This disclosure form shows significant investments in the fossil fuel industry and two of the fossil fuel companies Trump holds stock in are directly funding the Dakota Access Pipeline. Trump disclosed between $500,000 and $1 million in investments in the primary builder of the pipeline, Texas-based Energy Transfer Partners. He also disclosed $50,000 to $100,000 in investments in Phillips 66, which would own one-quarter of the Dakota Access Pipeline once completed. Trump's Other (Disclosed) Fossil Investments Include: THE REST OF THE ARTICLE CAN BE FOUND ON ....... EcoWatch.com!